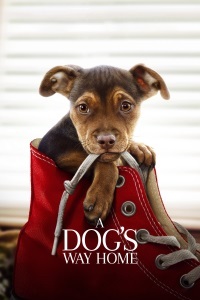 Directed by Charles Martin Smith, based on the book by W. Bruce Cameron (who also wrote A Dog's Purpose). The trailer for this was on before Spiderman. I was surprised that the entire film seemed to be given away in the trailer. We know she comes home! She survived an avalanche and saved someone. Isn't this the exact same film thst came out a year or two ago? I think that's the business model, yes. ... I saw the trailer for this, immediately thought “but The Incredible Journey already exists?” and about a half second later someone in the row behind me said the same thing out loud. Clearly what this movie needs is Michael J. Fox, a wise old golden retriever, and a snarky cat. I don't think I'll be watching this, after this spoilery round-up of difficult moments. I was mostly okay with it until the last item, which is my literal nightmare scenario for either of my dogs. That third-to-last item also seems really rough (too grim even to joke about it being "ruff"). It was a cat and the movie was Inside Llewen Davis. I'll just note that the animals in The Incredible Journey only travel 300 miles, and there are three of them, which made the whole enterprise easier. By my calculation that makes this dog's journey 400% harder! If that isn't worth watching, I don't know what is! Nobody goes to see this movie thinking it'll be any different. If they released it where the dog doesn't get home it would flop. If they released it such that the dog dies there would be nationwide riots 2 hours after the first showing and every movie theater showing it would be burned to the ground. More seriously, I think it's kinda brilliant. This is not a movie you go to in order to determine the resolution to the plot. You go to this to see the details and the floofs & moops along the way. This trailer tells you this movie is going to be a happy wish fulfillment that will aim to make you happy-cry. Anyone who would be turned off by this wasn't going anyway. Anyone who was afraid it might not turn out happy is now reassured and more likely to go. The only people impacted by this trailer are the folks who run doesthedogdie.com.